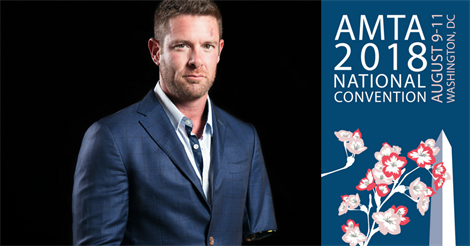 Sergeant Noah Galloway joins the Closing Session: Military Veterans and Massage Therapy, at the AMTA 2018 National Convention. Sgt. Galloway will share his inspiring story of real-life determination and the importance of considering all aspects of veterans’ health. As a veteran himself, Sgt. Galloway experienced a life-changing injury during Operation Iraqi Freedom. Just three months into his second tour of duty he lost his left arm above the elbow and left leg above the knee in an Improvised Explosive Device attack. After a long stint in recovery and rehabilitation, Galloway realized there was more to him than his injuries, and challenged himself to get back in shape, be healthier and inspire others. Now a fitness guru and a motivational speaker, Galloway travels the country sharing his story, encouraging and motivating others to live a life of no excuses. He not only talks the talk, but walks the walk, as shown in his most recent adventures – leading a team to victory on the FOX series American Grit, and taking third place in Season 20 of ABC’s hit series, Dancing with the Stars. AMTA is excited to have Sgt. Galloway join the closing session. It is important for us to bring the veteran’s voice into the discussion. This session will also include a panel of experts – Dr. Niki Munk, Nicole Miller and Dr. Chester ‘Trip’ Buckenmaier – who will explain the science and benefits of Massage Therapy for Military Veterans. There is still time to register for the AMTA 2018 National Convention, August 9-11 in Washington, D.C. You can choose from a full three days of education, a single day or just an exhibit hall pass! View all registration options to customize your convention experience.